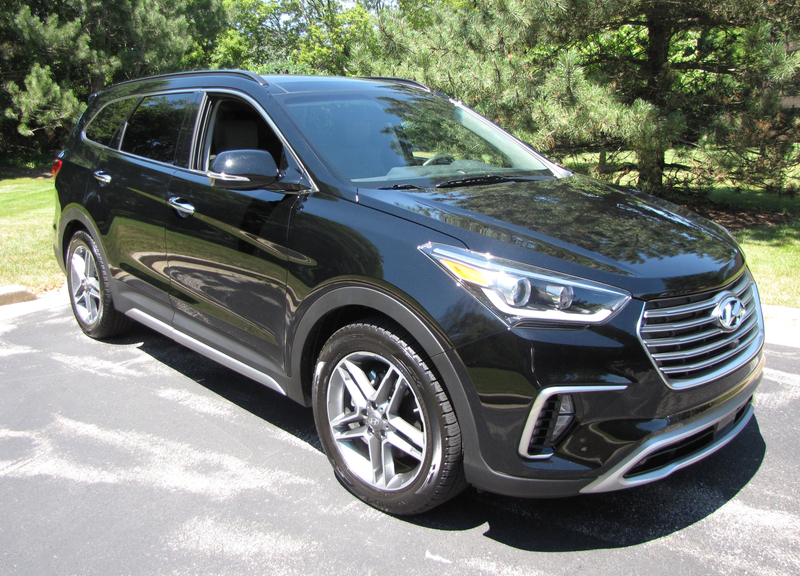 Hyundai developed its Santa Fe into two vehicles a couple of years ago, the Sport which has a midsize 106-inch wheelbase and the straight-up Santa Fe that’ll seat seven with its longer 110.2-inch wheelbase and more interior room. The 2017 Santa Fe looks even better than its predecessor and now adds more features to make it even more attractive and a strong competitor with the likes of Honda’s popular Pilot. But it has the misfortune of also going up against the brand new Mazda CX-9 reviewed last week and the new segment leader. That’s not to say the tested big Santa Fe is a slouch in any way. Its power is first-rate with a 3.3-liter V6 that creates 290 horsepower with 252 lb.-ft. of torque. 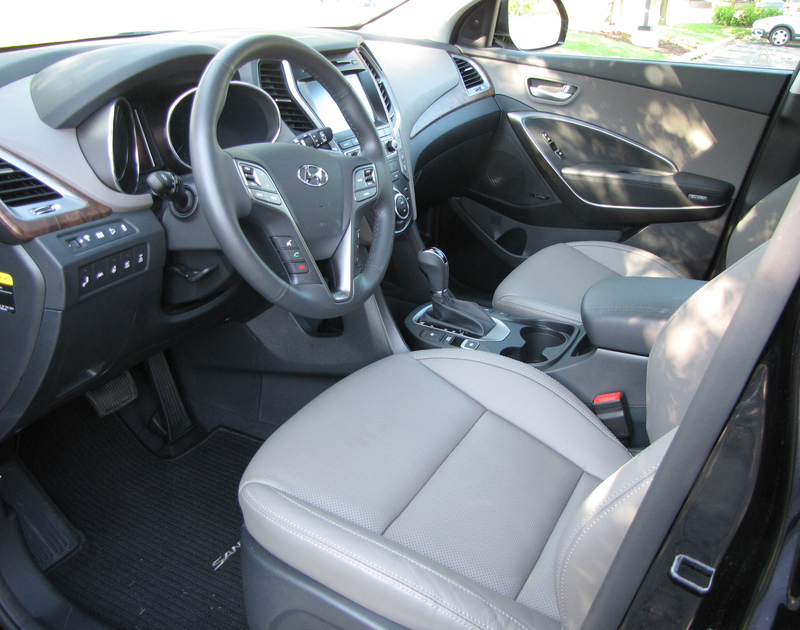 The Hyundai also offers drive select mode to emphasize power or economy. In Normal mode the Santa Fe has good power that is well used by its six-speed automatic. There is some lag to the acceleration, but the crossover gets up to highway speeds easily. Naturally Eco saves gas, but Sport delivers the most oomph when it comes to acceleration. In Sport mode the Santa Fe feels much livelier than most large crossovers. Handling also is quite good with little body lean even at higher speeds and in tight turns. The downside is that steering effort is heavy in Normal mode and even heavier in Sport. I think many drivers will opt to only use Sport on the highway or risk tiring as they drive around town. 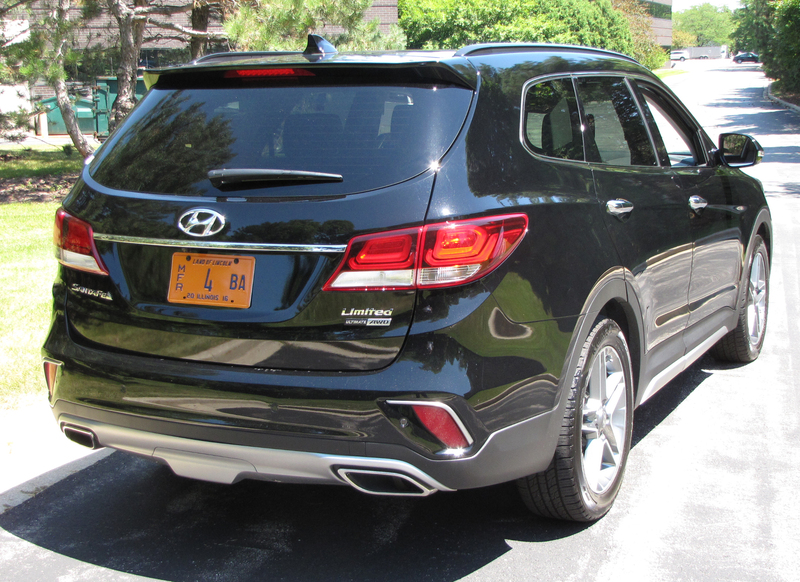 Hyundai has done a good job of firming up the ride in its Santa Fe, but some now may find the ride a little too taunt. You’ll feel some bumps, especially on crumbling city streets. The test model was the Limited Ultimate model with all-wheel-drive, which gives the vehicle more grip and stability in sloppy weather, plus upgrades to19-inch tires. All Santa Fe models come with stability and traction control. A base SE with front-wheel drive comes with the same powertrain as the upper trim levels and lists at a reasonable $31,695, while the AWD version lists at $33,445. There are two mid-level trims too, the Limited AWD that starts at $37,595 and SE Ultimate AWD that lists at $41,345. All trims also come in front-drive versions. 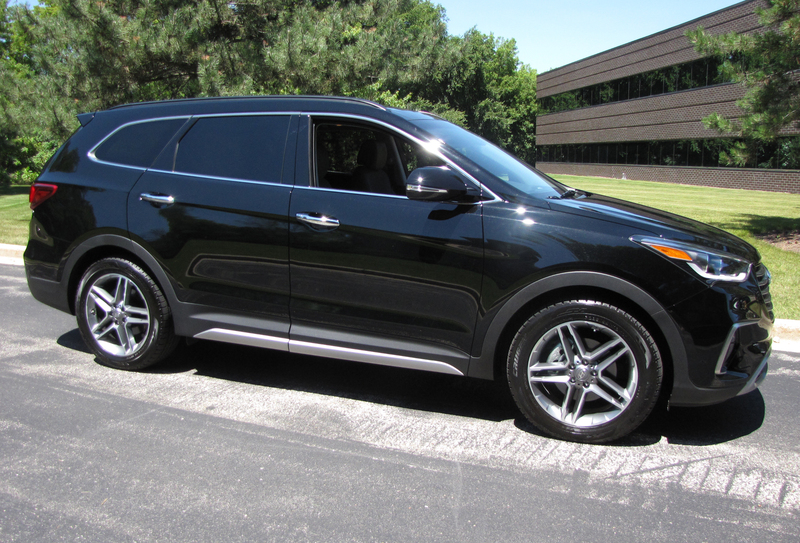 The tested metallic black Limited Ultimate lists at $42,395 and like the others delivers mediocre gas mileage. It’s rated at 17 mpg city and 22 mpg highway and I got 19.2 in an even mix of city and highway driving. That falls short of several other models, including the efficient Mazda CX-9 that managed 22.4 mpg last week. 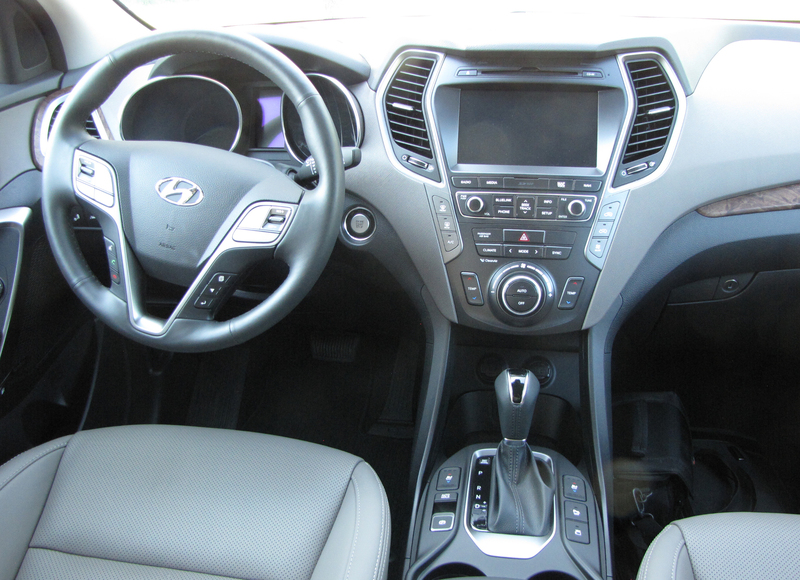 Inside, the Santa Fe was quiet and well equipped with a high-quality look and feel. Leather, which is standard in this top-level model, was gray with lighter gray stitching on the seats while the dash top was black and there’s fake wood trim by the dash’s outer air vents. Pewter look trim frames the center stack’s controls, plus the doors’ armrests and controls. It’s a luxury look, but not quite as luxurious as in the CX-9. Seating is extremely comfortable with well-shaped seats in both the first and second rows. Second row seats are captain’s chairs with fold-down armrests and the front seats are powered and both are heated and cooled. The driver’s seat has a power lumbar adjustment plus two memory settings and also powers back from the steering wheel once the crossover’s ignition is turned off. Push-button start is standard. 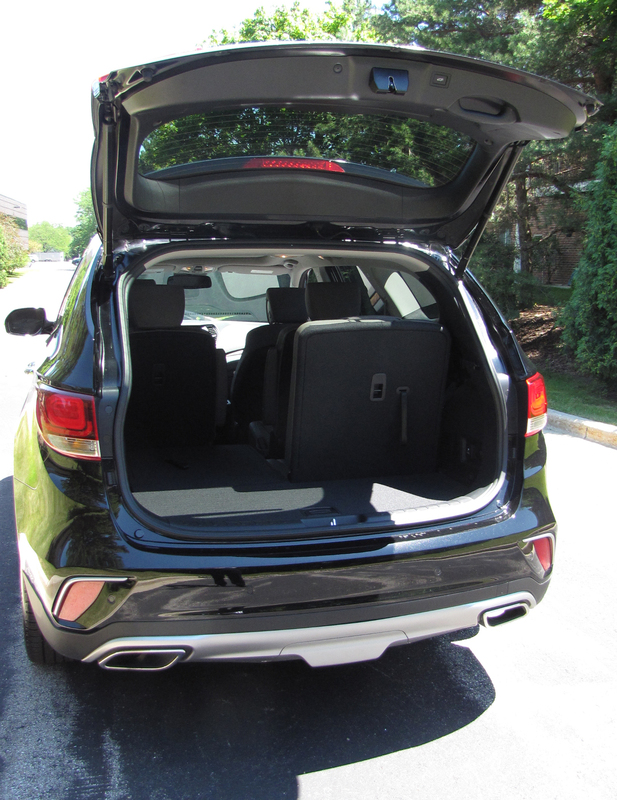 The Santa Fe’s third row seat splits and folds flat to improve cargo room, and certainly pre-teen children can fit in that back row when the seats aren’t flipped down. Hyundai creates another attractive dash with large 8-inch touchscreen (a 7-incher is standard on lower trims) mid-dash plus a clear array of buttons below that. The buttons are large too, so easy to see and they’ll be easy to use with a gloved hand in winter. This one has dual climate controls that are simple to use, but the radio controls on the touchscreen are a bit confusing and can be difficult to tune while driving. There’s a heated steering wheel here too, a nice winter feature. Since I had this during our recent heatwave I didn’t get to enjoy that feature. A cooled wheel would have been more to my liking this summer. Overhead is a giant panoramic sunroof that opens and includes a useful sun-blocking sun shade. 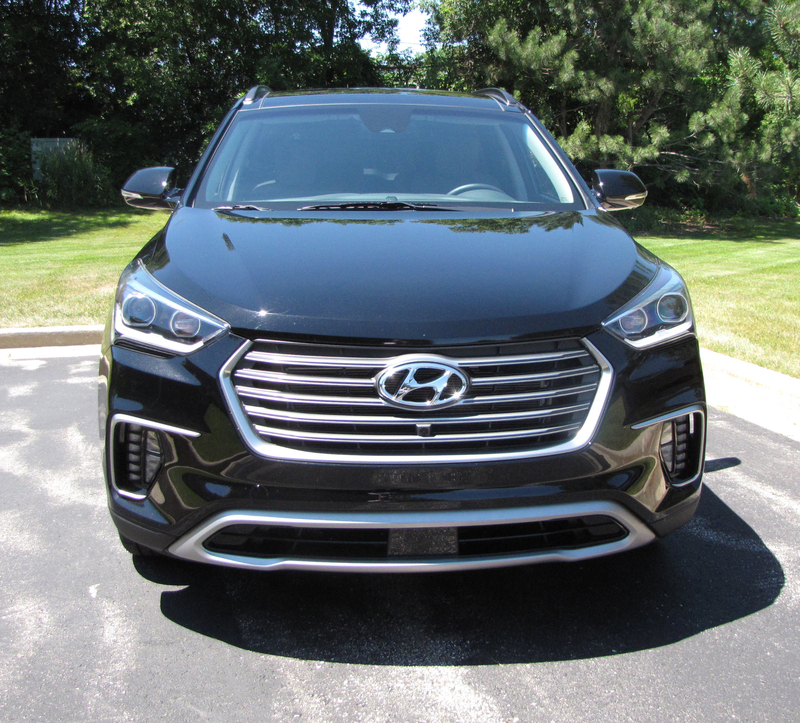 Hyundai also loads up this model with oodles of electronic goodies, including a multi-view camera that projects in the backup camera screen to aid in tight parking spots. There’s cross-traffic warning too and park assist, plus a lane departure system that can be turned off via button on the dash’s left. Strangely there’s only a driver-side blind-spot warning system, nothing on the passenger’s side. Plus Santa Fe has a smart cruise control system, but no way to adjust it. Possibly this was a pre-production model because the button that was to appear on the steering wheel to make such an adjustment did not exist. For the techno lovers there are two 12-volt outlets, a USB port and auxiliary hookup in the open storage box area below the center stack. Hyundai includes Blue Link telematics too, including an SOS emergency system too. There’s also a well-padded armrest/storage box sits between the front seats and the visors slide. Pricing and the 10-year, 100,000-mile warranty make the Santa Fe attractive, as does its exterior, power and towing power. However, the Mazda, for one, offers better gas mileage, a more luxurious interior and better ride and handling. Hits: Good looks, power and handling. Well equipped with heated/cooled front seats, heated steering wheel, giant sunroof, multi-view camera, comfy supportive seats, quiet interior and power hatch. Will seat7. Misses: Feels heavy and steering is heavy, plus a somewhat firm ride, especially in sport mode. Confusing radio tuning and only a driver-side blind-spot warning system.